2019 BOSS 9'2" Poly DXT for sale in Upper Marlboro, MD. Kohler Equipment is an independently owned company and is not affiliated with Kohler Co. of Kohler Wisconsin. SL3 L.E.D. with Ice Shield: SL3 headlight package, standard on every BOSS truck plow, shines brighter and farther than traditional halogen packages and is equipped with Ice Shield Technology. With best-in-class 100% LED lighting, integrated with Ice Shield Technology to prevent snow and ice build-up on the lens, these headlights use half the amperage of halogen systems and have an 8-10 year life expectancy. The SL3 headlights are also 40% smaller than SmartLight2 lights and yet much more powerful with the signature BOSS premium look you expect. SmartHitch 2: Designed to be simple and easy to use. Flip, plug, click. The three-step attachment process makes it easy to switch between plows. SmartShield: Made to last the SmartShield paint system delivers superior corrosion protection and a long-lasting, high-gloss shine. SmartTouch 2 Controller: Advanced control technology combined with ergonomic control features and large backlit buttons make BOSS controls highly intuitive and easy to use. Attach the versatile SmartTouch2 Handheld Control to a pedestal mount or mount it on your dash (with or without handle). Chainless Hydraulic Lift: The chainless hydraulic cylinder lifting system from BOSS uses a chainless, hydraulic lift system, which greatly reduces snowplow bounce and provides full float capabilities. Patented Dual Trip Design: Patented dual trip technology combines both a trip-edge and full moldboard trip system offering dual trip protection from obstacles like manhole covers to frozen snowbanks. 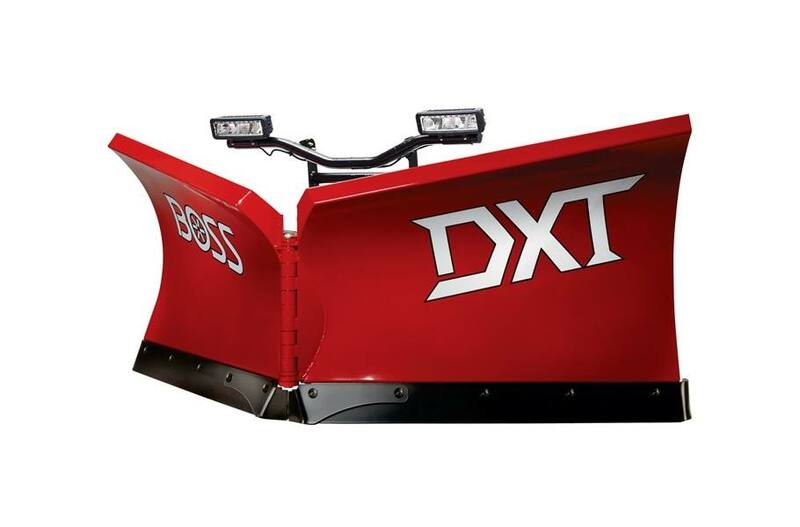 1/2" x 6" Base Angle: The tripping base angles on the DXT come standard with curb guards and snow catcher, and can be used as the cutting edge until worn. The optional cutting edge is made from Hardox® for maximum wear resistance and durability. SmartLock: SmartLock® Cylinders hydraulically hold the cylinder in position when back dragging. These single acting cylinders only run the hydraulic system to extend the wings forward. To return the wings, wing return springs do the work. This is a much simpler design with less moving parts and less wear on the hydraulic system. 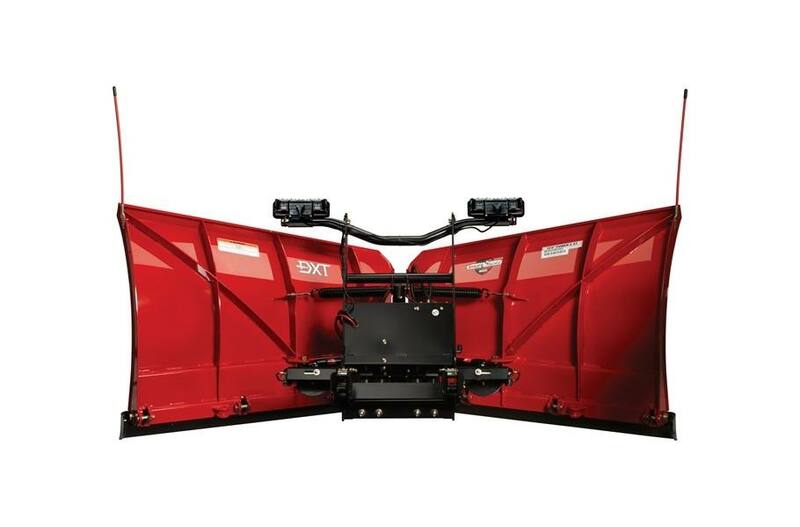 Snow Catcher: A proven patented snow catcher in the center section on every BOSS V-plow ensures that no snow lines are left behind. DXT Heavy-Duty Pushframe: The heavy-duty push frame and center section are designed for additional strength and durability. DXT Reinforced Moldboard: Diagonal cross-bracing and formed bottom channel increase blade rigidity. Flared Wings: with enhanced curl to throw snow with maximum efficiency. 2-Year Limited Warranty: The BOSS 2-Year Limited Warranty protects against material defects for peace of mind.